These kits are digital ballast kits for the Low beam or single beam headlights. Such as 881,894, H11, H1, H3, H7, H9 type headlight bulbs. Kit includes all needed components for true HID. All kits are 6,000K blue electrobe bulbs. GMC/CHEV projector headlight on 2015 new body trucks. These are NEW Brite Lites true Xenon HID conversion kits. 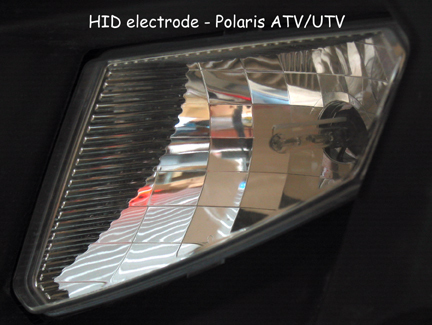 Totally converts halogen headlights to a arc module with digital balast for the ultimate in headlight technology. All Brite Lites HID units are 6,000 degree arc bulbs- for a pure white light color with a tint of blue- most common in a Lexus or BMW. No modifications needed to stock wiring or headlight housing- totally plug-n-play. Simple installation- less than 30 minutes for most vehicles. Rated life is 10,000 hours and draws less amperage than stock bulbs (about 3.2 amps & 35 watts). Kit includes a pair of HID arc bulbs, a pair of slim digital balasts, all needed wiring and connectors, zip ties, and mounting instructions/tips. Simple installation. About 4 times brighter than stock bulbs and no filiments to break. Size: D2S - Factory HID pr. Size: H11 - r-angle base pr. These are replacement HID electrode bulbs for our Brite Lites HID kit - 55 watt, single beam electrode. *SPECIAL PROMO PRICE* These are NEW Brite Lites LED conversion kits. Totally converts halogen headlights to a LED light. No modifications needed to stock wiring or headlight housing- totally plug-n-play. Simple installation- less than 30 minutes for most vehicles. Rated life is 10,000 hours and draws less amperage than stock bulbs (about 3.2 amps & 35 watts). Kit includes a pair of LED bulbs, wiring connector, and mounting instructions/tips. Simple installation. About 3 times brighter than stock bulbs and no filiments to break.